You can see that a common theme was the impact of the Web 2.0 phenomenon ( and I would include open source as an example of Web 2.0 ) on geospatial technology. Peter Batty started the session off with a "short history of GIS moving to the mainstream", which I found particularly fascinating for folks in the geospatial industry because it provided a historical perspective from someone who comes at this subject with a broader, I would say, non-traditional GIS perspective. To put this in context, the first time I met Peter was in the early 1990s when I was at TYDAC, one of the early innovators in desktop geospatial analysis applications, and Peter was at IBM. Peter had come to TYDAC to talk about GFIS. I have never forgotten Peter's presentation on the GFIS data model for storing spatial data in DB2. He has been involved in a lot of this and knows from first hand experience whereof he speaks. He has kindly allowed me to include his history of geospatial joining the mainstream here. 1991 - I [Peter Batty] wrote an article "Why use a standard RDBMS for GIS?" 1991 - Smallworld GIS is released, introducing some radical new ideas which jump it ahead. Its proprietary language and database offer significant advantages at the time. 1996 - MapQuest is launched, the first online mapping site. His point was that the disappearance of GIS has been predicted for a long time. Many people trace this concept back to the article in 1992 by Doug Seaborn, 1995: The Year GIS Disappeared (Proceedings of AM/FM Conference XV. San Antonio: AM/FM International, 1992) that Peter references. If we date the geospatial inflection point to June 2005, then Doug's prediction, also in San Antonio, was just 10 years early. As Peter remarked in a later session, we technical folks tend to expect things to happen faster than they do. It is an interesting coincidence that on Monday, the day after this workshop, Telefonica S.A. won the GITA Award for Excellence in Telecommunications for its SAGRE Constellation system, which relies on VISION* technology, developed by GeoVision, which was founded by Doug Seaborn in the latter half of the 80s, to store and manage spatial data in an Oracle RDBMS. The vision that Doug had in the late 80s is today's reality. The OSGeo and the MapGuide Open Source project have just announced that MapGuide Open Source has graduated from the incubation process and is now a full fledged OSGeo project OSGeo Announcement . Graduating incubation basically puts the OSGeo seal of approval on the MapGuide Open Source project. Geoff has been kind enough to lend me his blog to share an exciting project Autodesk has been working with the City of San Francisco and the Friends of the Urban Forest (FUF). The result – an Urban Forest Mapping System – is now live and maps information on the thousands of trees in the city’s urban forest. This effort also highlights the power of collaboration between a public, private, and non-profit organization bringing great benefit to the agencies and the citizens of San Francisco. This city-wide, dynamic on line map was developed by the San Francisco Department of Public Works’ Bureau of Urban Forestry (BUF) and FUF as a modular system that other cities and organizations can adapt to help them manage their assets – whether they are trees or any other part of the infrastructure. 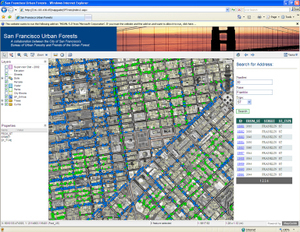 The Urban Forest Mapping System was built on a hybrid platform, incorporating MapGuide Open Source and open source Feature Data Object data access technology, using Autodesk MapGuide Studio. The system integrates the previously isolated data sets BUF and FUF each maintained. Now urban forest spatial data and inventory details from these two groups are combined and displayed on the City and County of San Francisco’s base map data for streets, land parcels and more, to create a powerful interactive, Web-based map. Trees (point locations) are mapped directly from the database using MapGuide Open Source. This is a very cool feature of the application because it removes the need to duplicate data sets (an all too common problem with GIS). This makes data maintenance much easier and ensures that application users always have access to the most current information. Business rules and logic were programmed using ASP.NET C# to define and control application activity according to user, user role and to track edit history. As a result, this system offers benefits to both urban forest managers and the community. It serves as a vital, technology-based tool for tree maintenance and management, enabling managers and the public to browse, inventory, and map existing, existing and future tree locations. Moving forward, BUF and FUF plan to incorporate additional functionality to facilitate management and planning. Additional on line reporting tools will allow urban forest managers to model and calculate a full cost-benefit analysis to take maximum advantage in San Francisco’s many micro climates and the unique requirements for San Francisco’s diverse neighborhoods. Additionally, the public can take a walk through the urban forest and learn about the trees in their neighborhood with a user-friendly web interface. Check out the map for yourself at SFTreemap.org.You can also learn more about the project’s background at Urbanforestmap.org . 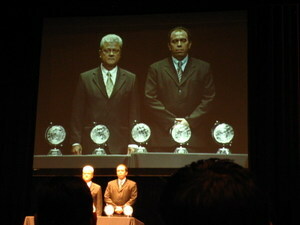 This afternoon in San Antonio, Paulo S. Furukawa, Director of Network Access, and Marcos Faria, who was the Network Records manager responsible for the Sagre Constellation project, accepted on behalf of the Sagre Constellation team, the annual GITA Award for Excellence in Telecommunications. I wrote a blog about Telefonica earlier last year, but I think it is worthwhile reiterating some of the outstanding achievements that led to Telefonica S.A. receiving this award. 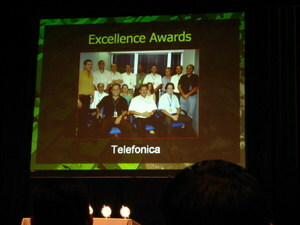 Telefonica S. A. was one of the first companies to attempt to automate the process of provisioning telephones and managing network infrastructure. At the time Telesp, which was later acquired by Telefonica, was a division of Telebras. The system that Telesp designed with the assistance of the Telebras equivalent of Bell Labs and which later become CPqD, was remarkable for its time and is still remarkable today. It is an integrated outside plant management and provisioning system, that stored all data including spatial data in a relational database (Oracle). The ability to store spatial data efficiently in an Oracle RDBMS was a key innovation and relied on technology developed by GeoVision, later VISION* Solutions, now part of Autodesk. Telefonica S. A. runs the telephone network for the State of Sao Paulo, which accounts for 60% of the Brazilian GDP, and has over 12 million customers and 14 million access lines. Every month they process hundreds of thousands of work orders generated by people who want a new phone, to get a new line, or need a repair. Three years ago Telefonica S.A. initiated a project that was recently completed to automate the entire process of provisioning. 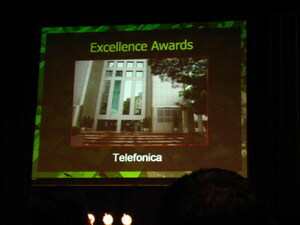 Marcos Faria was the technical lead for this project with full support of the IT team and Telefonica's higher executives. The resulting system a combined a centralized data repository for all spatial and other data in Oracle, integration with SAP, and CPqD's Outside Plant Management product with integrated provisioning support. Among other problems that the system resolved was the as-built problem. The project led to major benefits for Telefonica S. A. among which probably the most important from a business perspective was reducing the cost of provisioning by 40%. Anyone in the telecom business will immediately recognize what an incredible achievment this is. They eliminated their as-built backlog, reduced their provisioning life cycle to days from weeks. and achieved an ROI of 100% over the three year period of the project. Amazing!